Microsoft’s® mobile solutions continue to gain an increasing amount of the market share. With its visual interface that easily blends with other Windows® powered software, you will definitely see your existing systems continue to be optimized thanks to Microsoft’s® steady work at claiming a greater share in a marketplace dominated by Android and Apple. With intuitive haptic controls and sleek interfaces that allow you to maximize your use of top mobile apps, Windows Phone(TM) and the Microsoft Surface(TM) tablet are two brilliant possibilities to build development possibilities on. Because we are a certified Microsoft Development Partner, Software Development can develop and support innovative, cutting edge mobile solutions that take advantage of what the Windows OS offers. Our detailed knowledge and intuitive understanding of the Microsoft suite of programs empowers us in our pursuit of a thorough cross-platform enterprise solution that is ideal for your business. 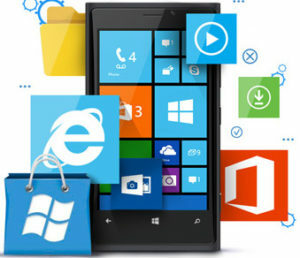 With functionality that harkens to Windows desktop and laptop software, Windows software is able to maximize a unique approach against what Android(TM), iOS(TM) and BlackBerry® offer. This familiarity that Windows offers gives professionals a great bonus, particularly if they have Microsoft products already in use in their business. Seamless backend integration with products including Microsoft Dynamics CRM, SQL Server, Exchange Server and Microsoft Office Live set Windows Mobile applications apart as a top choice for enterprise-grade solutions.